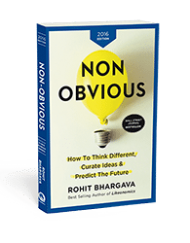 .The ALL NEW 2017 edition of the Wall Street Journal bestseller Non-Obvious featuring 15 NEW trends and updated ratings of over 60 previously predicted trends! What unexpected insights can a holographic Holocaust survivor and a Japanese film about soy sauce offer us about career development? How do self-repairing airplane wings, touch-enabled “skinterface” tattoos and smart locks predict the next trillion dollar industry? What can the surprising popularity of an odd Norwegian TV show and the rise of “quiet eating” in Spain teach us about buying behavior? 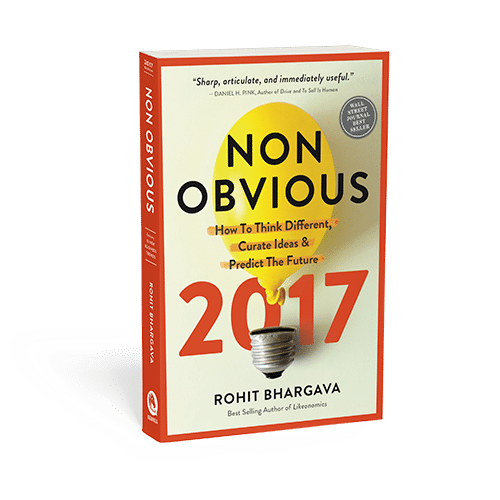 For the past 7 years, marketing expert and Georgetown University Professor Rohit Bhargava has curated his best-selling list of non-obvious trends by asking the questions that most trend predictors miss. It’s why his insights on future trends and the art of curating trends have been utilized by dozens of the biggest brands and organizations in the world like Intel, Under Armour and the World Bank. 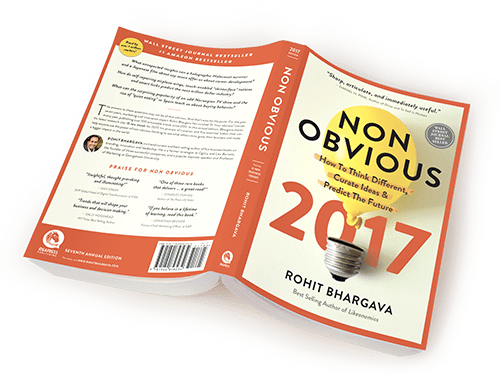 In this all-new seventh edition, discover what more than a million readers already have: how to use the power of non-obvious thinking to grow your business and make a bigger impact in the world. Fierce Femininity – As gender continues to become more fluid, fiercely independent women are increasingly portrayed as heroines, seen as role models and changing the world. Passive Loyalty – The ease of switching from brand to brand continues to empowers consumers – forcing brands to get smarter about earning true loyalty of belief versus loyalty of convenience. Robot Renaissance – As the utility of robots moves beyond manufacturing and into the home and workplace, they adopt better human-like interfaces and even may have micro-personalities built in. Moonshot Entrepreneurship – Inspired by visionary entrepreneurs, more organizations think beyond profit and focus on using business to make a positive social impact and even save the world. In total, the Non-Obvious 2017 Edition features 15 all-new trends for 2017 across 5 categories including Culture & Consumer Behavior, Marketing & Social Media, Media & Education, Technology & Design plus Economics & Entrepreneurship. The book also features a detailed section with a review and rating for more than 60 previously predicted trends – with longevity ratings for each.